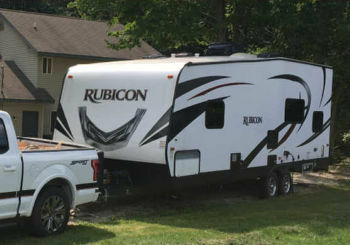 RVs are excellent vehicles when it comes to taking long road trips with your family. Life on the road can be quite the experience. However, the downfall of all that travel is the lack of clean clothes. I love my family, but if we were cooped up in a small space together for weeks without washing our clothes, I think I would lose my mind. Vacationing is one thing, but there are certain chores you just shouldn’t avoid. Washing your clothes is one of them. Each of these options comes in vented and non-vented forms. If they’re vented, it means it uses the air in the room to dry the clothes inside. This requires you to make a hole for the exhaust vent. Alternatively, the non-vented models heat the air within the drum to dry clothing. This negates the need to make a hole, however, they tend to take longer to dry clothes and the use a lot of water. The problem with stackable washers and dryers is that they don’t fit in smaller RVs and they use more water than other RV-specific models. Portable washers and dryers are compact and require very little electricity, but they tend to be very heavy and deliver low-quality washing. The most popular of the three for RV users is the RV washer-dryer combo, so that’s the one we’re going to focus on here. Which RVs Come with Washers and Dryers? 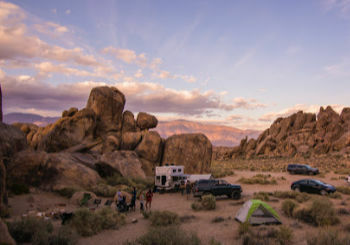 While many of you are probably here because you’re considering adding a washer and dryer to your existing RV, some of you may be interested to know which RV models come with a washer and dryer already included. This is just to name a few. Depending on where you buy your RV and whether it was pre-owned or not may also play a factor in whether it already has a washer and dryer. This custom tiny home builder puts one in standard in every build. How Much Water Does a Washer-Dryer Combo Use? As with regular washers, the amount of water that a washer-dryer uses is going to vary from model to model. However, on average, these combo machines tend to use about 10 gallons of water. As I said, that number will vary, but most high-efficiency washers will use anywhere from 15 to 30 gallons, while older washers will use 20 to 45 gallons. That being said, in comparison to high-efficiency washers, 10 gallons isn’t bad. However, it’s important to consider that these combo washer-dryers hold smaller loads, so you may have to do multiple loads. How Long Does a Washer-Dryer Combo Take to Dry? It is pretty general knowledge that washer-dryer combos take a significantly longer time to dry than regular stand-alone dryers. The average wash and dry time for these combos is about 3.5 hours or longer. To give you a good comparison, most standard, stand-alone washers and dryers can get a large job done in 2.5 hours or less. While the average time is just about an hour longer than the standard machines, there have been reviews and reports of other washer-dryer combos that have taken as long as 6 hours to wash and completely dry a load of laundry. Convenience is certainly a large factor in having a washer-dryer combo, but it’s good to remember that you may have a longer wait for your clothes. This factor isn’t as impactful if you plan on doing your laundry overnight, but if you’re in a hurry, it may not be the best tool. How Do You Clean a Washer-Dryer Combo? Cleaning your washer-dryer is only as complicated as you make it out to be, but it’s important. 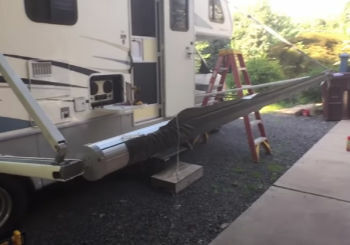 It’s simple—follow these directions to successfully clean your RV’s washer-dryer. First off, if your washer-dryer has a vent, you’ll need to wash that. You should do this fairly regularly, like once a month, to avoid build up. Use a drain cleaner to do so. It can be hard to clean the full length of the vent, but as long as you’re getting what you can reach you should be good to go. You should clean your washer-dryer from the inside out. Start with the inside to get rid of lint build up. If you go a long time without cleaning your washer-dryer, you’ll notice that it stops cleaning as well as it used to. The good news is that you can actually use your appliance’s washing settings to wash the inside. After emptying your machine, turn the dryer setting completely off. Set your washer to the cold setting and add one cup of bleach and run a simple cycle. You can add the bleach into the detergent compartment or directly in the drum. When you hear the water stop, press and release the Start button to initiate more water fill. When you hear the water stop filling, continue running the cycle with extra rinse. When the cycle is completely done, open the washer-dryer. Clean out the drum, catching any link that is sticking to it. Find the rubber seal and pull up the bottom of it to clean underneath. Things tend to get caught under there, and doing this will prevent build-up. Repeat this process one or two more times to successfully clean out all the lint and fully clean the inside of your washer-dryer. You should do this about every three months. As for the outside of your washer-dryer, you can clean this like you would any other ordinary appliance in your house. If you prefer bleach, you can use it, or any other cleaning product you like for smooth appliance surfaces. Use a strong cleaner and a sponge or a washcloth to wipe down the whole outside of your washer-dryer. This doesn’t necessarily affect the operation of your machine, but for general cleanliness and health, it’s good to wipe down the dirt and germs now and then. What Maintenance is Required for a Washer/Dryer? Aside from the main cleaning, there are a few things you should do to take care of your washer and dryer. There are small areas of your washer-dryer that you should clean that you might miss while you’re hitting the main spots. One of these is the detergent dispenser. You can fully remove this piece, making it easy to wash simply in your sink with soap and water. Next, you should clean out the coin trap. This part is located at the bottom of your machine. It collects small items that fall out of pockets or get trapped in the laundry. Turn the coin trap knob and pull it out. Wash and dry all the part and then put it back into place, tightening it securely. Finally, there’s the water inlet filet. This process requires a little more extra attention, but it’s a good idea to do it anyway. Remove the inlet hose and run water through it until the water runs freely. Clean the unit connects and use pliers to remove the filters, rinsing them under warm water. Reinstall everything properly. There are also a couple of things you can (and should) do regularly to maintain your washer-dryer combo. The first maintenance steps you should always take it cleaning the lint screen before each load of laundry. Too much lint build-up could potentially cause a fire, though it’s rare. But more so, if there’s even just a little bit of lint on the screen, your combo machine is going to have to work harder to dry your clothes. Wipe down your machine regularly. We already talked about cleaning your machine, but it should be a fairly regular practice for you to wipe down the outside surface to avoid soap corrosion. Do your best not to beat up on your machine. Don’t overfill it with large loads or slam the door too much. Little things build up over time, and if you want your machine to perform and last long, you have to treat it properly.